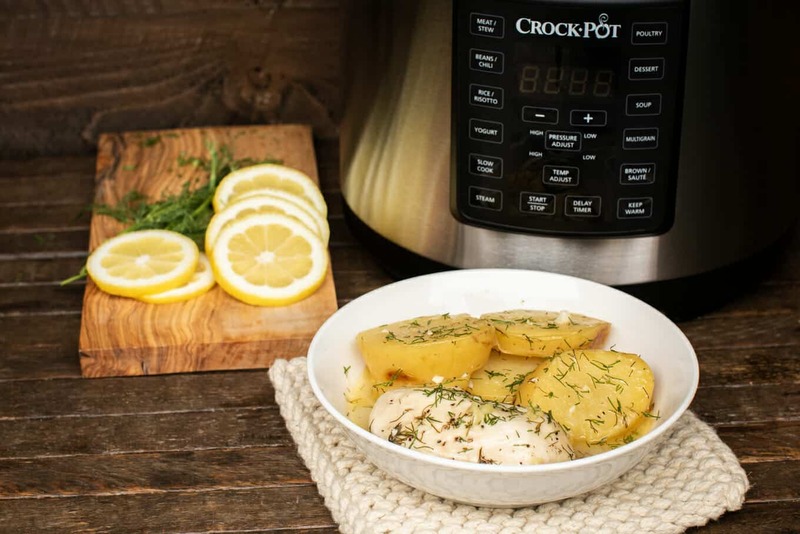 Pressure Cooker Lemon Dill Chicken with Potatoes is a one pot meal full of flavor! This post is sponsored by the Crock-Pot® Brand, but all opinions are mine alone. Hello! 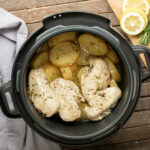 Today I am sharing a pressure cooker recipe made with my new Crock-Pot® Express Crock Multi Cooker. This is the first recipe on the blog that isn’t made in the slow cooker! I’ve been testing out the pressure cooker for the last few months, so this is not my first try, just my first recipe I am excited to share on the blog. The Crock-Pot® Express Crock Multi-Cooker can cook meals up to 70% faster, which is great for days I don’t get to the store early in the day. 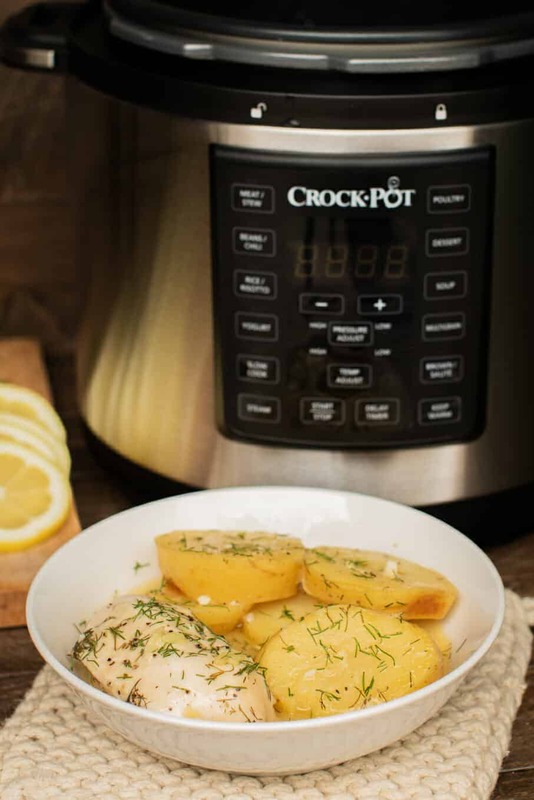 What’s great about this device is it can slow cook as well, so you can slow cook while you’re at gone at work or you can cook something quicker on the pressure cooking setting if you are short on time. The device also has a steamer function, brown/sauté function and 8 preset buttons that cook a variety of meals. I’m not going to lie, I use those preset buttons a lot for my recipes, as it takes the confusion out of pressure cooking for me. My inspiration for this recipe was to make a one-pot meal. 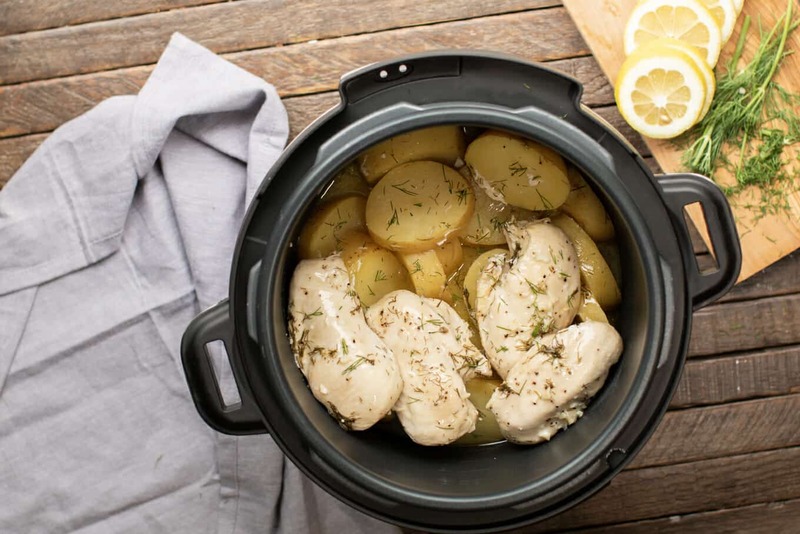 I know the slow cooker can do a great job with chicken and potatoes together, so I had to see how a pressure cooker would do. For this meal I make a sauce out of butter, broth, lemon juice, garlic, dill, salt, pepper, and also used cornstarch to give the sauce a little weight to it. I decided on Yukon Gold potatoes, they are beautiful in this recipe along with the lemon sauce. 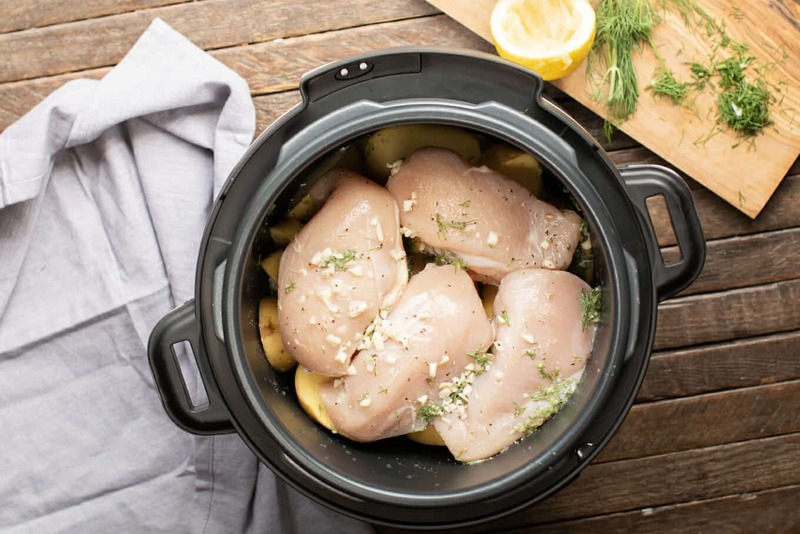 I often use dark meat in my recipes, but I really wanted to try boneless skinless chicken breasts in the pressure cooker. They turned out great, very moist and tender. I have been very happy with my Crock-Pot® Express Crock Multi-Cooker. I’ve made beans, roasts, turkey breast, enchiladas and applesauce! Though I will never part with my slow cooker, I love having the option to cook meals faster. I use the 6-quart version of this appliance, and Crock-Pot also makes a 4-quart mini and an 8-quart XL. The 6-quart is just the right size for the recipes I make for my family. 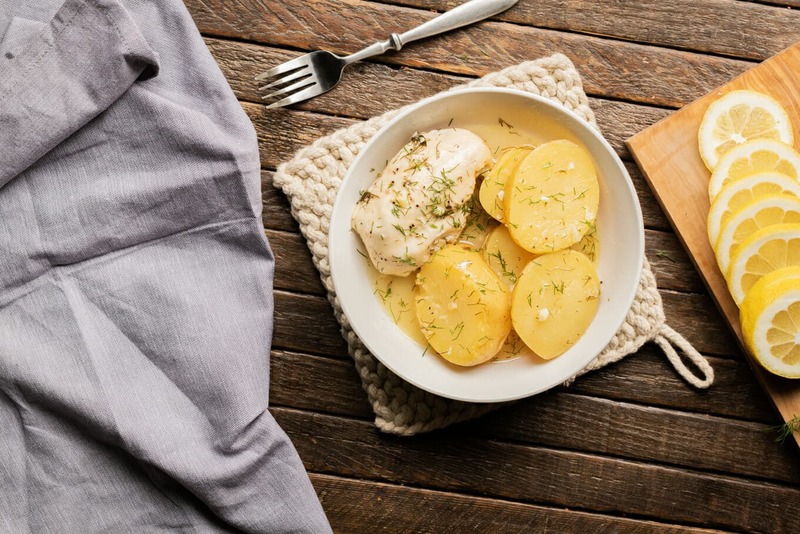 I hope you give this recipe a try – my family loved it, the sauce was rich and tangy, the chicken moist and tender and the potatoes turned out really buttery. Have a great weekend! In a small bowl add the melted butter, chicken broth, lemon juice, cornstarch, garlic, dill, salt and pepper. Stir until combined. Set aside. Add the potatoes to the bottom of the Crock-Pot Express® Crock Multi-Cooker. Add the chicken breasts over the potatoes. Pour over the lemon dill sauce over the potatoes and chicken. Secure the lid. Press the poultry function, set the pressure to HIGH and set the time for 15 minutes. Be sure the steam release valve is in the "Seal" (closed) position. Press start. When the cooking time is complete, and the pressure has been released serve the chicken and potatoes with the sauce drizzled over. This recipe is so easy and delicious, I love it!!! I’m so glad you are doing pressure cooker recipes. I have one and never use it because I don’t have recipes. Looking forward to making this. Yes, I also just bought a multi-cooker this past week. I’ll be very interested in reading any recipes. Thank you. I can’t wait totto this! I love this recipe in the slowcooslow with pork. I’m so glad you are doing pressure cooker recipes. I’ve bought one recently and have used it a few times and love it. So I’m interested to see what great recipes you will be sharing. Thanks. Do you do natural release or quick release after the cooking time? How do you think if I browned the chicken first? Probably the same amount of pressure cooking since the potatoes still need the full amount of time. Thank you for the recipe! This is in the pressure cooker right now. I searched for a recipe to use up some of the world’s smallest chicken thighs plus some excess potatoes and didn’t want a heavy, dairy or tomatoey sauce. Not having fresh dill I substituted some diy Greek seasoning and from the way it smelled I know it is going to be delicious with the fresh lemon juice. With this great introduction to your blog I’ve got to spend more time and see what other great recipes you have. Thanks again, I know it will be delicious.